Click on the bars below to all the subdivisions and condo & townhome complexes in Dacono. You can also view the most popular searches such as ranch style homes, new construction, homes with a pool or houses with mountain views. Click to see Local Subdivision and Complex Maps. What is Your Dacono Home Worth? Dacono Colorado is a small municipality sitting 30 miles north of Denver along the I-25 in the North Metro region. Thanks to its ideal location, Dacono has become a favored place for homeowners wanting fantastic access to the big city while remaining in the splendor of Colorado’s landscapes. Close enough to downtown Denver to serve as an ideal commuter location, Dacono, CO also provides a window into traditional Colorado living, complete with access to the stunning scenery that defines our state. Because of Dacono’s popularity and growing reputation as a commuter location, the town has become notable for affordable subdivisions that are perfect for families. Indeed, most homes are available for under $500,000, and the average property size in Dacono ranges from 1000 to 3000 finished square feet. Homeowners seeking the most affordable living in Dacono, Colorado will be suitably impressed by the Downtown area and Glens of Dacono. As this is not a city, complexes are in short supply, but Dacono does host two; Carbon Valley Townhomes and Sundance Townhomes. Highlighting the growing popularity of Dacono, newer subdivisions are starting to develop, such as the builds at both Sweetgrass and Autumn Valley. As mentioned, Dacono is a fantastic commuter town for families wishing to remain surrounded by nature. Parents with children will attend schools in the St. Vrain Valley RE -1J or Weld County RE-8 school districts. Despite a population of under 5,000 people, Dacono is a surprisingly rich place in terms of things to do. Residents will find a solid supply of locally owned stores, bars, and restaurants. In addition, downtown Denver is a 30-minute car ride along the I-25, providing all the amenities you or your family could want. To the west, the foothills of the Rocky Mountains stretch into the distance, offering trails and outdoors days aplenty. In Dacono itself, the town has numerous pocket parks that serve communities, providing consistent greenspaces in the heart of subdivisions. A recent success in Dacono, CO, has been the town’s Splash Park, a space that allows people to enjoy water-based activities on a hot summer day. For thrill seekers, Dacono is home to the Colorado National Speedway, a NASCAR sanctioned track that is a member of the NASCAR Whelen All-American Series and hosts the NASCAR K&N Pro Series West each year. One annual event in Dacono brings together people within the town and thousands more from surrounding areas. The Carbon Valley Spirits & Music Festival is an event that includes live shows, specific kid-based activities, spirit tasting, and a fireworks display. Dacono, Colorado is quickly becoming a popular destination and the breadth of home choice is reflecting this surge. Gold Compass Real Estate is the leading name in buying and selling property in Dacono, the North Metro area, Denver, and Colorado as a whole. Our team of qualified agents is best placed to ensure you find the home you desire. 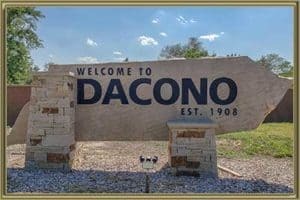 See a list of attractions and Things to do in Dacono. If you are looking to sell a property in Dacono, Mike Lies and the team at Gold Compass Real Estate is here to help. Our expert agents can give you confidence by showing you the local market, including trends and prices. Our service includes arranging staging and consultations. To get the process of selling a home in Dacono underway, get your free Dacono Home Value Instantly Online now. Gold Compass Real Estate works directly with clients to ensure the smoothest experience when purchasing a home in Dacono, CO. Agents are available to show you everything about Dacono, such as giving you expert knowledge on subdivisions, schooling, security, transportation, and things to do. We update our online listings frequently to reflect any changes in properties, while we provide a complementary Free Personalized Market Report. For more information on moving to Dacono, CO, contact us at 305-325-5690.